In the previous page, you got a brief overview of the code that makes our class work. In this page, let's look at how to actually add more circles - both manually as well as programmatically. When you run your movie, each circle will move with its own independent values for speed, radius, etc. That should be pretty clear by now since you already saw from the explanation of how your BlueCircle class works, what its constructor does, etc. While adding your movie clips manually is easy, there will be many cases where that can be tedious. For complicated scenarios where you cannot predict the quantity of movie clips to display or what properties your movie clips exhibit, you need to know how to add movie clips from your Library programmatically via code. 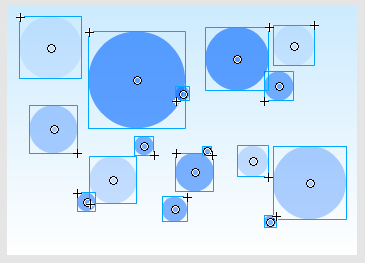 When you run your application, notice that you now display ten circles with random positions, alpha, and scale! 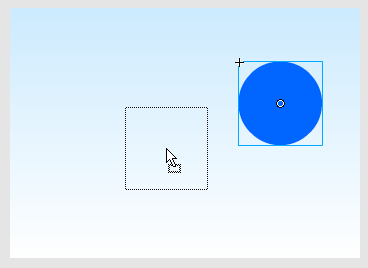 Best of all, you didn't really have to manually drag and drop any circles in order to do that. To understand what the previous code does, take a look at this tutorial Displaying Library Content in AS 3.0.